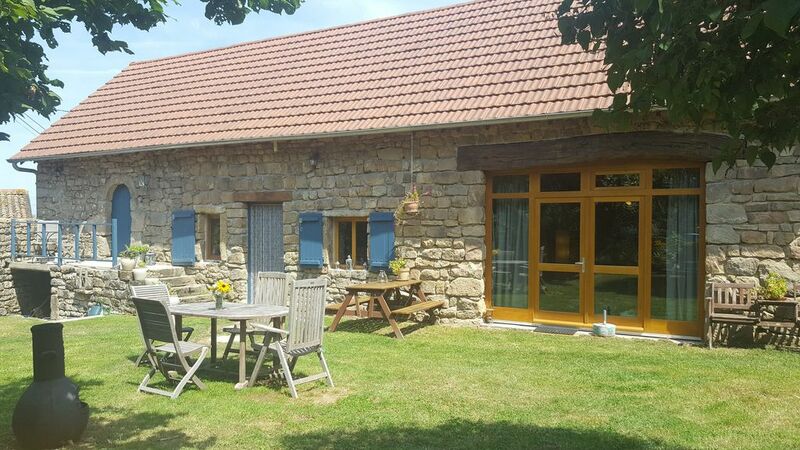 Romantic family holiday home Gentilhomme near Cluny, Taize and Macon! A complete holiday home with everything you need for a fantastic relaxing holiday. The house is fully equipped and has been built by us in recent years. What was a pile of stones 10 years ago has now become a beautiful home! The house is child-friendly and radiates the peace and quiet you need to come all the way to yourself. With a luxurious bathroom and large garden. There is a large sleeping loft with 1 double bed 160x200 and a large sofa bed 120 x200 and 1 single bed 90x200. The master bedroom has a king size bed of 180x200 and a baby bed. The bathroom has a spacious walk-in shower, luxury bath and washer and dryer. Also there is a possibility with changing mat to take care of your child. The kitchen is equipped with: oven, microwave, coffee maker, kettle, hand blenders and dishwasher. In the living room there is a sofa, nice armchairs and a dining area for 6 people. There are two high chairs available. Het was een plezier om de familie Salden te mogen ontvangen in ons huis! bedankt voor deze fijne reactie en we hopen jullie zeker nog een keer te mogen ontvangen in Gentilhomme! Een beschrijving van het huis wordt u toegemaild. Een sleutel van het huis is te verkrijgen middels een sleutellocker met code.